Eggplant and peppers are not subjected to early transplanting because they're more tender, especially eggplant. It may seem harsh treatment in cold, raw weather for the tomatoes, and I do delay planting in some years. Remember: Tomatoes must be well-protected when set out before their regular time. ...When all danger of even light frost is over, the tender crops go in. In my area, that means about May 30; in northern New England, even later. In areas of short summers, most gardeners risk a few plantings ahead of the "safe" date. I sow a few bush beans in early May, and perhaps a hill or two of summer squash, protected under a hotcap, glass jug, or loose mulch of leaves or straw. 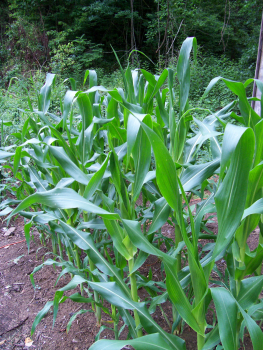 Last May I planted Spring Gold, an early corn that starts well in cool weather.